In 2019, Pueblo Grande Museum (PGM) will be observing our 90th anniversary as an institution. As part of our celebration, we’re featuring interesting research happening at PGM. One of our largest research projects is the fifth volume of the Pueblo Grande Archival Project Series (Archival Series). The project began in 1989 with the goal of creating an archaeological report for the unpublished excavations conducted within the boundaries of Pueblo Grande Museum and Archaeological Park. These excavations began in 1929 and continued into the 1980s. Before the Archival Series, the results of more than 50 years of work had never been published or reported. To date, three volumes have been published. The fifth volume of the Archival Series will focus on objects excavated from the site, and the documentation is being conducted by professional archaeologists who are volunteering their time. We’ve asked each archaeologist to select the most interesting object they’ve analyzed for a blog series leading into our 90th year as Pueblo Grande Museum! Our fifth featured blog is by City Archaeologist Laurene Montero – Laurene manages Phoenix’s City Archaeology Office and is advisor to the Phoenix Chapter of the Arizona Archaeological Society, has served as Board Member at Large on the Arizona Archaeological Council, and currently serves on the Tempe Historic Preservation Commission. 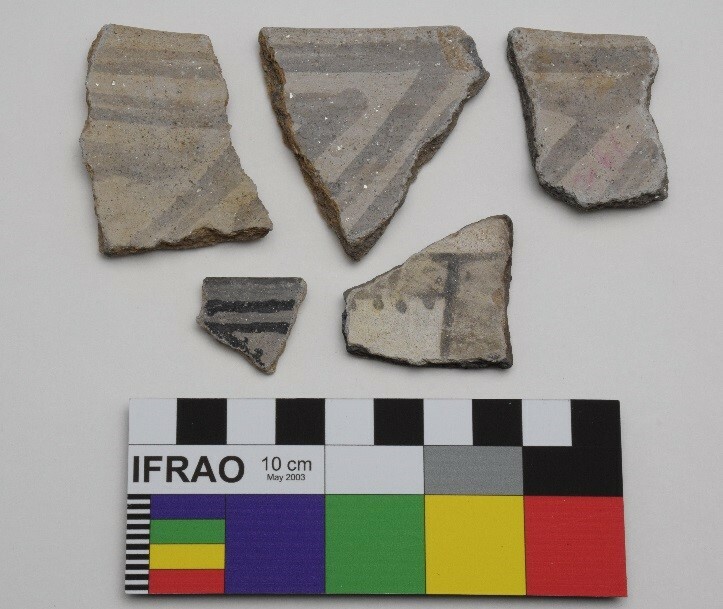 For the Archival Series, Todd Bostwick and I compiled a study of non-local ceramics found at the site of Pueblo Grande. 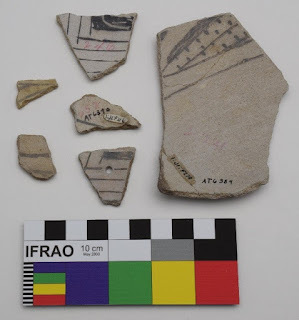 My favorite non-local ceramics are the San Francisco Mountain Gray Ware pottery sherds. They’re interesting because they are somewhat uncommon at Hohokam sites and they came from farther away than most other non-local sherds found at the site. Studies of this pottery ware indicate that some of the volcanic minerals contained within its paste were obtained from an old rock formation at the bottom of the Grand Canyon! Despite decades of research, a definitive clay source for this pottery ware has not yet been identified. Potters who made San Francisco Mountain Gray Ware must have gone to considerable effort to obtain their materials. We do know that San Francisco Mountain Gray Ware was produced between AD 750/800 to 1100 by the Cohonina Culture of northern Arizona – a culture that lived on the Coconino Plateau in an area that extends from south of the Grand Canyon to Flagstaff and Williams. Both are types of San Francisco Mountain Gray Ware.